Numerator. Photos by Christopher Duggan. Serenade. Photos by Stephanie Berger. Grand Duo. Photo by Timothy Norris. Grand Duo. Photo by Erin Baiano. 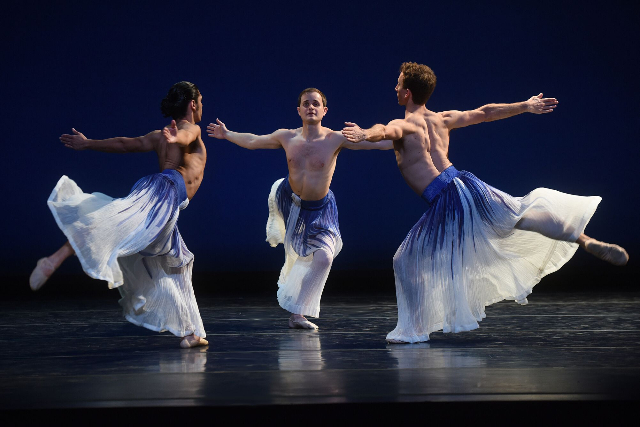 In the decades during which we have attended performances by the Mark Morris Dance Group a particular sensitivity to music, with an emphasis on the classical composers, has been unique to the choreographer's practice. Now middle aged and portly we are among those fortunate to recall Morris as a performer. There are vivid memories of the wit and easy grace with patented moves of Morris in gold top hat and tails performing a soft shoe vignette under the former Dance Umbrella in Boston. 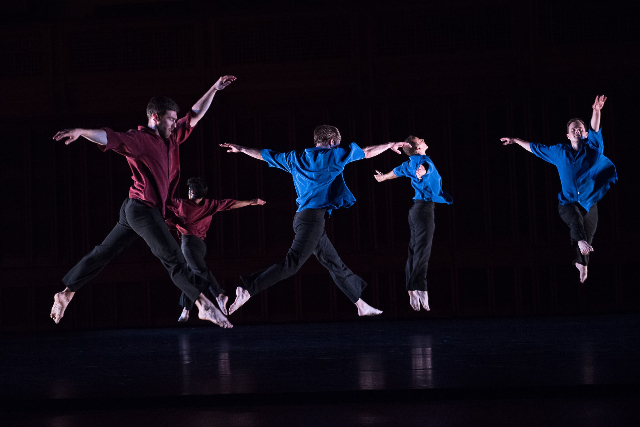 It is that memory of his performance that forms a neo platonic template for the paradigmatic eccentricities that inform the dances we viewed last night at Tanglewood. This was particularly true for what, to me, was a highlight of the evening the solo Serenade. It was the last work that he designed for himself in 2003, now 14 years ago, marking an end to that phase of his career. He was then 47. The piece was performed magnificently by Lesley Garrison. But if you could glaze over, zone out and pierce the fog of time one might well evoke the shade of Morris in all of the quirky expressive moves. It must be poignant and challenging for a legendary performer to morph into the role of mentor and inspiration for a company of dancers in their prime. What must it be like for him to see someone else as Dido a gender bending role that shocked and changed the dance world? So many of his once exotic innovations have become the norm for contemporary dance. In now annual performances at Tanglewood, for example, a once cutting edge company has become the essence of established and mainstream. One no longer attends an evening of his dance to be shocked or surprised. 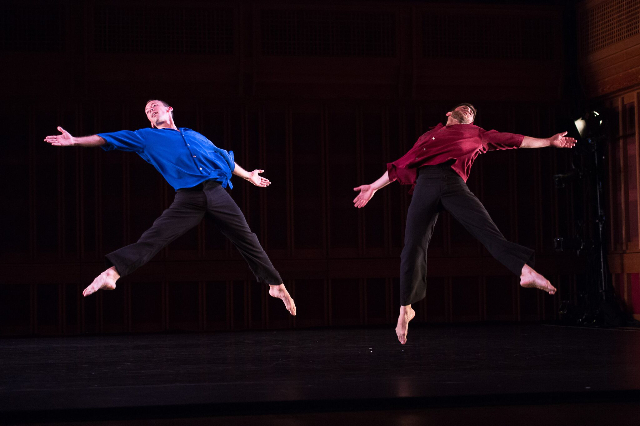 In the world premiere of Numerator, a piece for six male dancers in colorful shirts and black pants designed by Elizabeth Kurtzman, it elided seamlessly with three works, the oldest from 1993, all set to music by a Morris colleague and friend, Lou Harrison. Familiarity with the Morris persona and signifiers encourages one to focus on the nuances and details of the works. It is rather like visiting the Old Masters in a museum. Which, for better or worse, is a mandate for Tanglewood's programming. With its focus on the diverse and exotic music of Harrison there was cohesion and symmetry to the program. In his composing Harrison conflated many influences from cutting edge contemporary to exotic non western elements and instrumentation including understated but pithy percussion and time signatures. In that regard the four pieces felt both uniquely different and yet comprised threads of commonality. Although a recent work from 2015 the gender blending and exotic costuming (Martin Pakledinaz) of Pacific evoked signature Morris concepts. It was a spacey, contemplative piece with the time stretching feeling of gamelan although confined to a trio for violin (Xiaofan Liu), cello (Francesca McNeeley) and piano (Michael James Smith). Transitions in the serene piece were evoked by the solos of the instrumentalists in turn as well as their ensemble playing. The piano was particularly percussive which is a strong element of a gamelan experience. Both men and women wore ankle length skirts of soft, light fabric with delicate colors. 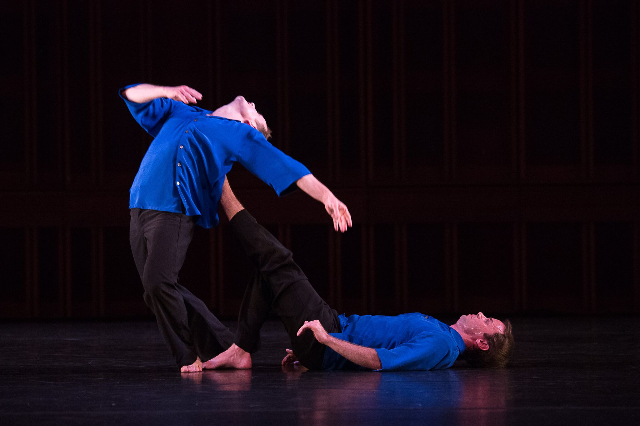 The emphasis was on the beautiful with long, flowing arm movements and dream evoking, meditative interactions. The distinctions of gender were suppressed in favor of expression of the commonality of humanity. The impact on viewers is serene, peaceful and meditative. The new piece Numerator, by contrast, was aggressively masculine. Again the music featured a trio of Liu, violin, and Smith, piano, joined by Nick Sakakeeny on percussion. There was surprise when the dancers one by one sprawled and crawled along the floor. This was a motif that was repeated. Another gesture entailed clenched hands as indicators of tension and perhaps agita. As is true when six men gather there were aspects of machismo, competition and hierarchy. It would perhaps be better to say five men and a soloist. When he performed, for example, the other men joined hands in closed ranks forming a kind of wall or marker for the soloist. In another by now familiar Morris touch the men paired off as buddies dancing with each other implying intimacy with lifts and carries. Again, this was shocking decades ago but now seems rather de rigueur. After intermission we returned for Serendade. OMG, it was everything one could possibly hope for in an evening of Morris. The music Serenade for Guitar (Robert Belinic) and Marcelina Suchocka, percussion, was almost but not quite flamenco. There was just the right balance between tradition, grounding and free interpretation to make the music and resultant dance utterly fascinating. In this work the lighting by Michael Chybowski, and costume by Isaac Mizrahi, were particularly essential. Garrison was attired in a white blouse and black bottom. We first encounter her stationary with her upper body spotlighted. Her outstretched arms circled furiously in precise synch with the textured percussion of the music. We wondered if she would ever move from this provocative and arresting stance. She did indeed as the piece unfolded in five movements Round, Air, Infinite Canon, Ursul, and Sonata. 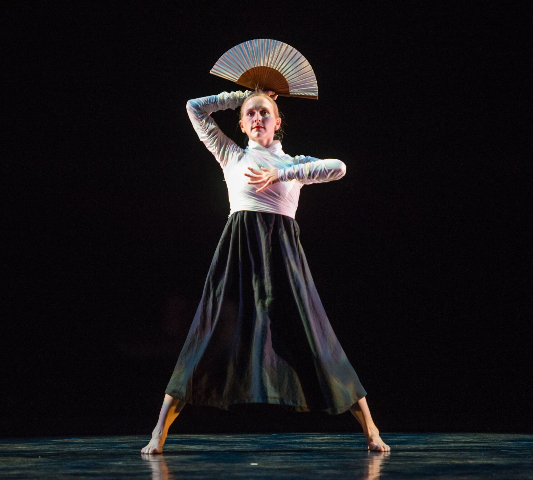 The movement and dance stretched out from and then returned to its flamenco roots. In one passage, for example, she applied cymbals to her fingers. Glancing back across the stage at the musicians we were surprised that Morris had joined them to play castanets. This is not credited in the program. His work was indeed impressive. Again evoking but morphing flamenco traditions there was an interesting variation of uses of a folding fan. It is Morris at his most playful teasing us with the familiar and then pushing it to new and amusing variations. The program ended with Grand Duo the oldest work and an audience favorite from 1993. 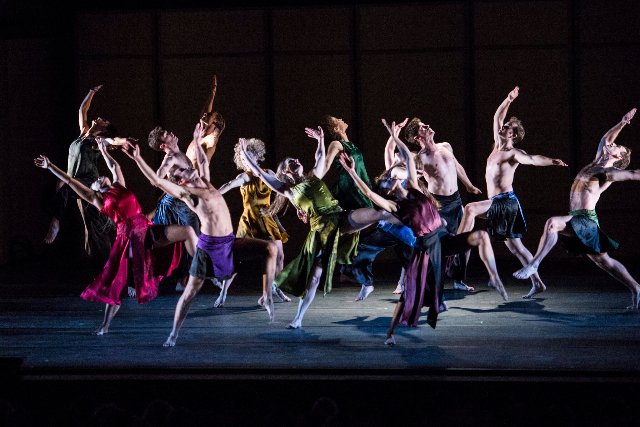 It is a large and complex work with the full company of 14 dancers on stage. It evoked senses of space, time, design and architecture with an emphasis on masses and groupings. With so many dancers and elements it was distracting to sort the dynamic of attention to individuals or to view the stage as a panoramic whole. Overall, we enjoyed four very different experiences of Morris and the music of Harrison.